There’s comes a time where you just have to forget about all your fears and bite the bullet. Today is that day. The above image is what my site has looked like for the past two and a half years. But, that has finally changed. Along the way there was a lot of resistance from myself. I’ve never undertaken such a big project before. I wasn’t just going to buy a domain name, install WordPress, and slap a pre-made theme on it. I wanted to build something better and different than what I already had, but still keep it familiar to readers who’ve been with me along the way. 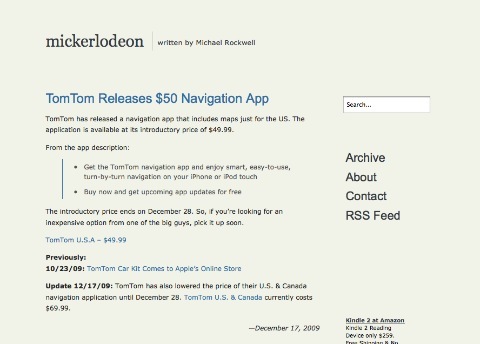 The structure of the site is the same, I even used the same WordPress theme files as I used on mickerlodeon. But, the color scheme and font choices should look a lot more attractive to browsers of the site. There was a lot of work that went into these design changes, even if it doesn’t seem like there was. I also had some design work done that I wasn’t able to do myself. The new logo at the top of the page was designed by Aaron Mahnke of Wet Frog Studios. He was a pleasure to work with and managed to design a fantastic logo for Initial Charge, even when I had little to suggest to him. But aside from all the design details, there was a lot of changes that I wanted to get done. There’s a brand new archive page that lists every feature article I’ve written for the site. There’s a projects page that lists some of the other things that I’ve been working on, like my geek-related apparel site that I’ve entitled “Geek Tees” or the suggested reading page that lists my most recent liked articles on Instapaper. There’s now a dedicated section of the site that shows all of the Linked List items. I also offer a few RSS feed options on the Subscribe page, there’s an articles-only feed, a Linked List-only feed, and the main feed which contains both. So, a lot of work went into the new site. And, I was trying to do all of this while working a full time job and making an attempt to keep up with writing (which has been hit or miss as of late but will change from this point forward). So, that brings me to the section where I talk about what I didn’t ship and why I titled this “Biting the Bullet.” The biggest fear I have about launching this now is that it doesn’t feel finished yet. This is mostly because of my own expectations about what I would have done when I finally flipped the switch. For one thing, I wanted to re-categorize and re-edit everything I’ve written on this site. This proved to be too much and, unfortunately, became a part of this project that never really got off the ground. Another thing that didn’t ship was the Mac Media Server project. It is listed on the Projects page as “coming soon” but I don’t really have a timeframe for when it will be finished. This is undoubtedly the biggest disappointment to me. I have thought about this project for a few years now but didn’t have the resources until just recently to actually make the project happen. The Media Server itself is finished and is working away in the closet of my office streaming video and audio to all the rooms in my house. But, the actual write-up explaining how I set it up, listing the software that I used, and why I made the decisions that I did isn’t finished yet. All of my notes for the write-up are in a spiral notebook just waiting for me to find the time to write it. There were other things that I wanted to get done before I launched Initial Charge, but those (and the ones mentioned above) are just going to have to wait on the back burner for now. I’m incredibly proud of the site and everything I’ve done to get it to where it is today. I would love to hear feedback about the changes — good, bad, or otherwise — so don’t hesitate to email me your thoughts. So, going forward I expect to be writing a lot more often and have that writing be a lot more meaningful than it has been over the past few months. Getting everything ready to go for this launch has been quite taxing on my free time and I know that with it out of the way I’ll be more likely to write much more thoughtful pieces and link to much more interesting things in a timely manner. But for now, thanks for reading.